Hi folks. Just a quick news item. I wanted to play with WordPress 3 and thought the best way would be to create a new blog to try it out. Conversion can have its issues, so I thought I would wait a little longer and do some research before upgrading my tokerud.com and studio-manager.com sites to WordPress 3. Having fun over at janet.tokerud.com where I’ve started my personal blog called The Janet Tokerud Blog. This name may not last more than a couple more days as I didn’t want to wait for a good blog name to come to me. So I’m going with it for now. I like being able to use janet.tokerud.com as a URL. Better than a whole new domain called janettokerud.com. Not crazy about the double t’s in the middle. 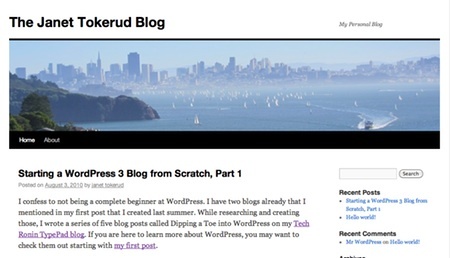 I just wrote a post about WordPress 3 you might be interested in. I may write a few more posts shortly as I learn new things about WordPress 3. So far I like it a lot and really enjoy the new default theme called Twenty Ten. The site is currently using the default without modifications. I’m sure we’ll find lots of things to tweak but I’m impressed with the theme right out of the box. Even though it is going to take a while to figure out how to take care of every single minor issue that occurred moving from our static website to this blog-driven WordPress site, we are sure it is a great move. We’ve got the basic pages of our tokerud.com site up now with tabs across the top for navigation. Switching web hosts is about as hard as switching from static to blog-based, so we are not sure doing both at once was such a bright idea. About a week ago, we committed to using the Thesis Theme for our tokerud.com WordPress site. That cost us $87. We had so much fun and are so enthused, that we’ve now started building up the studio-manager.com site as a WordPress site. Our $87 license for Thesis Theme is a one blog deal, so we limped along since last Thursday on the studio-manager site with the Kubrick theme. Not pretty! Today, I decided to use Thesis on my new studio-manager wordpress site. So, that cost $77 more. Now, though, I have a license that lets me use thesis theme on as many sites as I want for my own use. If you value your time and you think you have a good theme, it saves time to use the same theme. You learn once and apply twice. And, since these are both related sites, the resemblance is a good thing. We have over 25 pages to migrate on the studio-manager.com site, so it is going to be a while before we transfer the studio-manager.com domain to our new blog-based site. More to follow. The tokerud.com site has been around since 1995, but I’m a blogger and wanted to make tokerud.com revolve around a blog. From my point of view, blogs are superior technology. They package together a ton of functionality and allow me to formulate content in bite-sized chunks. Blogs make it easier for our visitors to see what is new, recent, or about a particular topic. Blogs make it easy for people to interact with us through comments and create interesting conversations. Blogs organize site content so that others can link to it so they don’t have to just say – “you know, that paragraph in the upper right corner”. Since I started blogging in 2003, WordPress has become dominant as a blogging tool. My other blogs are TypePad-based. Now I want to make my previously *static* websites: tokerud.com and eventually studio-manager.com into blogs with extra pages for content that is relatively static or for reference. I just started this blog tonight and plan to back fill in my blog-like posts that are currently up and running on the tokerud.com site. Eventually, this blog will take its place but there’s lots of research and design and learning to do before that happens. If you happen to discover us here in our formative days, welcome. Keep in mind I am shopping for a the ideal wordpress theme. Right now I’m using a free WordPress theme called Connections Reloaded. I like it, but I really want 3 columns so this is just temporary. What you are seeing if you are reading this at a later date is probably much different by now. I’ll document what I use once I’ve settled on something. By the way, I won’t just use a theme as is, I’ll tweak it further.